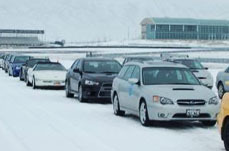 WinterX™ is timed competition much like Autocross or Rallycross. But instead of competing in a local parking lot, you get to drive on one of the several configurations of Miller Motorsports Park, the greatest race track in the United States. Unlike Autocross,drivers do NOT have to work the course. Just sit back in a heated room sipping hot coco until your next driving session.